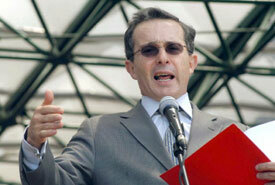 Colombian President Álvaro Uribe is riding high in the polls (Photo: Fernando Ruiz/Notimex-AFP-Getty Images). President Álvaro Uribe, riding a wave of strong public approval ratings at the end of the first year of his administration, has embarked on a bold campaign to bring the leaders of Colombia’s rightist paramilitary movements to the bargaining table even as the army maintains pressure on the nation’s leftist guerrilla forces. Most Colombian commentators credit Uribe with considerable success in restoring some security and confidence to a nation that has been physically and psychologically devastated by decades of civil conflict. But they also question whether he can pull off this delicate political balance—waging war and peace simultaneously.